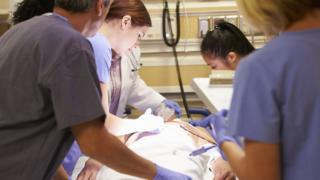 Overseas visitors should be forced to pay for using some GP services as well as ambulances and A&E care, the government says. It would save £500m a year and ensure such patients made a fair contribution, the health secretary said. Earlier in the year, the government indicated it intended to charge for A&E and ambulance care, but this has now been extended to some GP services too. Doctors' leaders said GPs should not act as "immigration control". Under the proposals, refugees and asylum seekers would be exempt from charges, and no-one would be denied emergency care at the point of need, the government said. A consultation will start on Monday. Visitors from outside the European Economic Area (EEA) - which covers the European Union, Iceland, Liechtenstein and Norway - already pay for planned non-urgent hospital care. And in April, new rules came into force which mean non-EU citizens settling in the UK for longer than six months are required to pay a "health surcharge" as part of their visa application - which, according to the Department of Health, has already produced £100m in savings. But the proposed changes would also see such patients charged for GP services such as blood tests, lung function tests, prescriptions, dental treatment and physiotherapy. "We want to make sure that everyone makes a fair contribution to services, by extending charging to make sure visitors pay for the care they receive," Health Secretary Jeremy Hunt said. "This government was the first to introduce tough measures to clamp down on migrants accessing the NHS and these changes will recover up to £500m per year to put back into frontline patient care." Prof Nigel Mathers, honorary secretary of the Royal College of GPs, said: "One of the founding principles of the NHS is that healthcare is free at the point of need and limiting access would fundamentally change that. "General practice is already under immense resource and workforce pressures so it is imperative that GPs and our teams do not find ourselves acting as immigration control and being burdened with even more bureaucracy." The British Medical Association has previously said doctors are meant to treat patients and "not to act as border guards". "A doctor's duty is to treat the patient in front of them, not to act as border guards. Any plans to charge migrants and short-term visitors need to be practical, economic and efficient," a spokesman said. Visitors from EEA countries must present a European Health Insurance Card (EHIC) when using the NHS, so that the cost of their healthcare can be recouped from their government. However, visitors from the EEA countries without an EHIC, and those from outside EEA who receive non-emergency treatment in NHS hospitals in England are now being charged 150% of the cost under changes also brought in earlier this year to discourage "health tourism". The government consultation will close on Sunday 6 March 2016.